Are You Ready is written by Bob Harper, who is known for his appearances as a fitness coach on the television show, The Biggest Loser. He gives readers insights into the concepts of his effective approach to weight loss in his book. Bob Harper’s program is based on helping dieters to gain an understanding of the root causes of overeating and then providing them with practical strategies to overcome the obstacles to permanent weight loss. His goal is to provide people with the guidance they need so that they can change their lives by achieving better physical and emotional health. See Also: Bob’s latest book The Skinny Rules. Bob Harper says that addressing the emotional issues that cause people to overeat is fundamental because until this occurs, dieting is an exercise in futility. In this book he provides dieters with a four-step strategy that will allow them to identify and eliminate negative thought patterns and behaviors, while at the same time working on improving self-esteem and confidence. Bob Harper says that his program does not involve dieting but instead is a healthy way of eating. He advocates a balance of carbohydrates, protein and fats however carbohydrates are restricted to a certain degree. Whole grains and certain fruits are permitted in moderate portions. He reminds dieters that everything they eat should be beneficial for their health. Eating before hunger appears is advised so that you don’t experience cravings for unhealthy foods. Dieters eat small frequent meals up to six times a day, depending on their weight and activity levels. Are You Ready also includes sample menu plans and tips for eating out, on vacation or when limited for time. Blueberries, strawberries, apples, grapefruit, lettuce, asparagus, broccoli, spinach, oatmeal, brown rice, whole-wheat bread, Wasa crackers, eggs, chicken breast, turkey, salmon, tuna, lean beef, cottage cheese, yogurt, flaxseeds, almonds, peanut butter, nonfat mayo, mustard. Bob Harper encourages dieters to make exercise a part of daily life for its ability to enhance weight loss as well as for reducing the risk of diseases such as heart disease, diabetes and cancer. Are You Ready includes three weeks of workouts, which progressively increase in intensity, and involve a combination of cardio and strength exercises. Workouts range from 20 to 60 minutes and are designed to tone, strengthen and reshape the body, while also burning calories. Photos are provided of a large number of weight training and core strengthening exercises as well as yoga postures. Are You Ready! 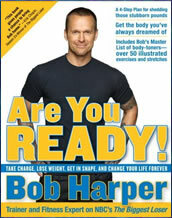 : To Take Charge, Lose Weight, Get in Shape, and Change Your Life Forever by Bob Harper retails at $22.95. Includes weight loss success stories that will be motivational for many readers. Places a strong emphasis on the psychological factors involved in successful weight loss. Encourages keeping a food journal, which has been associated with a greater chance of dieting success. Bob Harper is a well-respected fitness and nutrition expert. Results may take a while to become apparent. Beginners may have difficulty with the exercise routines. Will require some time to be spent planning and preparing meals. May not appeal to dieters who feel that they are not emotional over-eaters. In Are You Ready! Bob Harper focuses on emotional issues to help you discover the real reason for your weight gain so that you will be able to overcome the barriers to your success. He provides dieters with a comprehensive and holistic program that addresses diet, fitness and psychology to create a healthy lifestyle approach to weight loss.